The Radiation Laboratory in Berkeley, California, was the birthplace of particle accelerators, radioisotopes, and modern big science. This first volume of its history is a saga of physics and finance in the Great Depression, when a new kind of science was born. 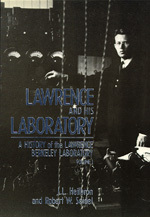 Here we learn how Ernest Lawrence used local and national technological, economic, and manpower resources to build the cyclotron, which enabled scientists to produce high-voltage particles without high voltages. The cyclotron brought Lawrence forcibly and permanently to the attention of leaders of international physics in Brussels at the Solvay Congress of 1933. Ever since, the Rad Lab has played a prominent part on the world stage. The book tells of the birth of nuclear chemistry and nuclear medicine in the Laboratory, the discoveries of new isotopes and the transuranic elements, the construction of the ultimate cyclotron, Lawrence's Nobel Prize, and the energy, enthusiasm, and enterprise of Laboratory staff. Two more volumes are planned to carry the story through the Second World War, the establishment of the system of national laboratories, and the loss of Berkeley's dominance of high-energy physics. J. L. Heilbron is Class of 1936 Professor of History and History of Science at the University of California, Berkeley. He is the author of Dilemmas of an Upright Man: Max Planck as Spokesman for German Science (California, 1986), among many other books. Since 1985, Robert W. Seidel has been the Administrator of the Bradbury Science Museum at the Los Alamos National Laboratory. He holds a Ph.D. in history from the University of California, Berkeley, and has written numerous articles on the history of the DOE national laboratories and on the history of military laser research and development.